Storm Cat won $570,000 in his racing career, which lasted from 1985-1987. But in his second life, he was the most prolific and successful stud horse in the history of racing, at one point bringing in $500,000 per foal. The numbers, from the Daily Racing Form, are staggering. 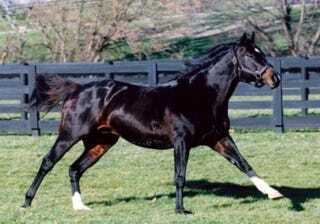 Over 20 years he sired 1,452 foals, 462 of which sold at public auction for over $319 million. He sired 1,110 starters and 807 winners, including eight champions and 35 Grade/Group 1 winners. Storm Cat retired from studding in 2008, and was euthanized on Wednesday at the age of 30. He was buried on his farm.